Possibly the most famous of all German prisoner-of-war campsduring WW2, Colditz was the final destination for so-called "incorrigible" allied officers who had repeatedly escaped from other camps. Ironic, then, that it saw more successful escape attempts than almost any other camp. Then again, given the nature of the prisoners it housed, it's perhaps not so surprising. They had, after all, got rather good at escaping from POW camps by the time they reached Colditz, and putting them together in one place enabled them to compare notes and build on thier previous experiences. In 1972, life at the prison was compelling dramatised in Colditz, one of those series that gave British TV a good name, but preceeding it by a comfortable seventeen years was The Colditz Story, a stout WW2 prison escape drama directed by Guy Hamilton (Goldfinger, The Battle of Britain) and starring John Mills (Ice Cold in Alex, Scott of the Antarctic), Lionel Jeffries (Chitty Chitty Bang Bang), Bryan Forbes (The League fo Gentlemen, The Guns of Navarone) and Eric Portman (The 49th Parallel). 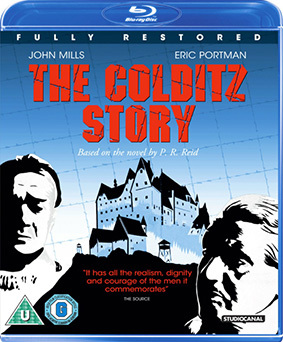 The Colditz Story will be released on UK Special Edition DVD and makes it's Blu-ray debut on 10th December 2012 from Studiocanal at the RRP of £15.99 for the DVD and £19.99 for the Blu-ray.